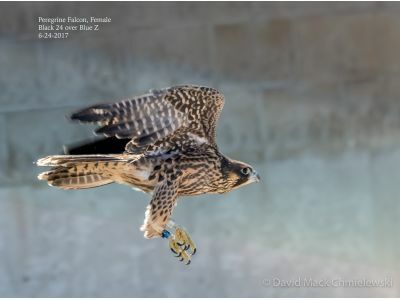 Apex, the female fledgling that has been in rehab for a couple weeks following collision with a building on her fist flight, was returned home and released on June 24. She had a very strong flight right out of her carrier. Her parents were not close by when she was released as is our usual process and unfortunately, she just kept flying. We have not spotted her or gotten any reports of a downed bird so we hope that she is fine. We would appreciate knowing about any sighting of a young falcon outside the vicinity of the Fifth Third bank or a sighting of two juveniles at once.